"This has been such a hard week. We are heartbroken that Winston is now no longer with us, but he is alive and well in our hearts and souls and will be there forever. We had an appointment with Larry, our vet, this morning, so he could see how Winston was doing. Winston had been so lethargic yesterday when I came home from work for lunch, and he hardly wagged his tail. He seemed to have a little more spirit when I came home after work at 5:30. I spent all evening cuddling with him and telling him how much I loved him, which he already knew. Overnight, the whites in his eyes turned yellow and his gums were pale and yellowish. We took him on his last ride in the car this morning at 9:30 a.m. Larry said that his liver had failed and that he wouldn't last through the day. 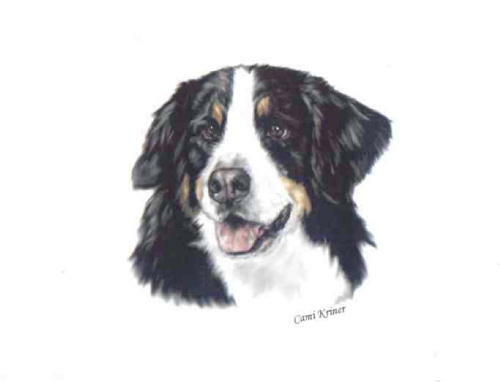 We held him gently and hugged him and told him that we'd be all be together again someday and that he should go to the Rainbow Bridge to play with Bern and Bobdog. 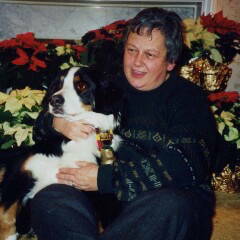 I miss him so very much - we did everything together. We drove to Jay's house after we left Larry's office to let them know that Winston was at the Bridge and we all cried together. When we got home, it was snowing those big, fluffy snowflakes that Winston loved. He would lie in the snow and let the big snowflakes fall all over him with the most contented look on his face. 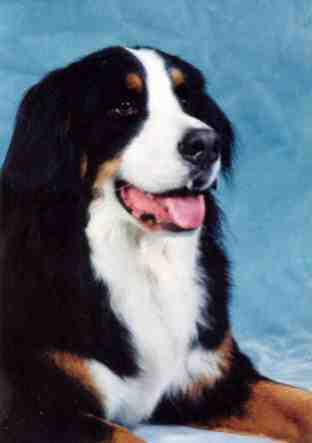 He was my very special boy....... " Joye. 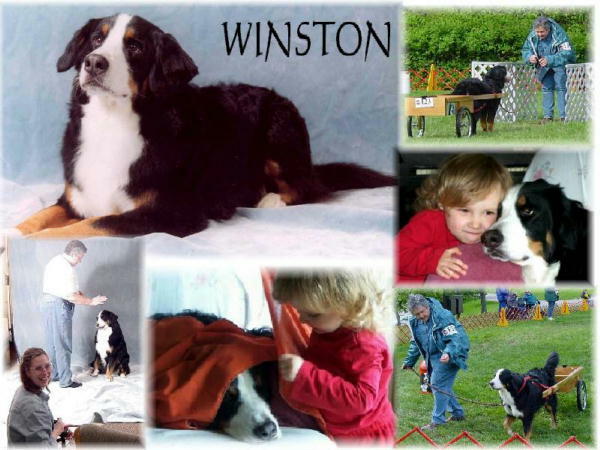 These very beautiful photographs of Winston were taken for Joye and Bill by good friend, Pat Long. And these fun pictures of Joye and Bill's granddaughter, Ella, and her Best Buddy, Winston. Click on the individual Images to enlarge. 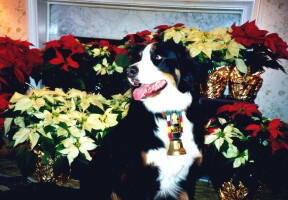 Winston and Joye, Christmas 2000. Winston was such a wonderful gift to us all...he gave you and your family so much love and great memories; and he gave us all the blessing of meeting you. Berners and their people have so much to thank him for! I put together some of my favorite photos I have; that's the way I'll always remember Win. Tears run through my smile as I see them. A candle is lighting by my window to welcome that sweet, gentle and shiny new star we have tonight. Enjoy your regained health, dear boy, and say Hi to Normann and Baxter for me. 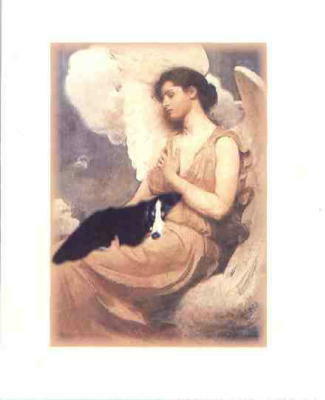 "Took Bussard did this notecard of Winston lying on an angel's lap after his passing. When Ella was born, we dropped off Winston at Took and David's house (Winston was 18 months) and Took snapped a photo of him lying on their sofa. She took that photo and made the angel card."